When I was growing up in what used to be Czechoslovakia (the Czech Republic and Slovakia now), people never ate cereal for breakfast. I don’t think anything like cereal was even available. Some folks ate oatmeal (ovsené vločky), but for most the typical breakfast consisted of a raisin bread with jam, bread with a meat spread (pašťeka), hemendex, or, the meal I show in this post, sweet grits with cocoa and cinnamon, krupicová kaša (meaning grits porridge). If you never had grits, you should definitely try this recipe. It’s delicious. 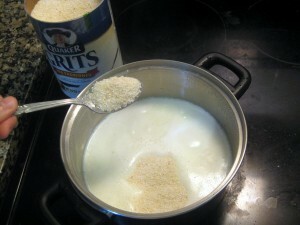 You can prepare grits by cooking them in water instead of milk. I actually used to use water, until I saw a recipe on this recipe page (in Slovak) suggesting milk. 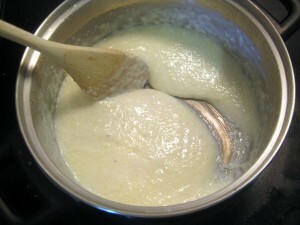 Grits turn out creamier (and tastier I think) when cooked in milk. Besides milk and grits, you will ground cinnamon, sugar, butter, and cocoa powder. I used the 100% kind found in the baking section, but you can use a hot chocolate mix instead. Bring the milk to boil and add the grits. Also add one tablespoon of sugar. Take unsalted butter out of the fridge to let it soften up. Reduce the heat, and stir until grits thicken enough so they don’t immediately fill in the gap left behind the stirring spoon. This will take about 15 to 20 minutes. 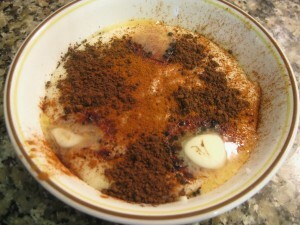 Pour the grits into a bowl and top with a tablespoon of ground cinnamon and a tablespoon of cocoa. Then add 3 thin slivers of butter. Serve un-mixed along with hot chocolate or cocoa. Stir in the toppings before eating. Enjoy! 63 comments - What do you think? While I was writing the article, it occurred to me that perhaps what I consider typical breakfast may be totally unusual for others. Slovakia is a small country but we have quite a bit of variety when it comes to food. So, I would love to hear from you. Did you grow up in Slovakia? If yeah, what do you consider typical breakfast food? And how does it compare to what you eat now? And for those who grew up in the USA, did you ever used to eat grits? I have heard that grits are very common (mainly in the south), but in the 15 years I have lived in the States, I have never actually seen anyone eat grits. Ever. Thanks! I used to have “krupicova kasa” for breakfast every Saturday and Sunday + when I was sick and didnt have to attend school. It was a special and irresistable treat and I could not have imagined my weekends without it. In our family it was definitely a breakfast meal. The rest of the week breakfast consisted of hot cocao and butter bread with tomatoes or fresh green peppers (during summer season) or bread with any kind of pate or salami/ soft cheese rest of the year. prepacte, ale nic v zlom – “krupicova kasa” made of coarsely ground wheat, ie krupica, is not “grits”. Grits are corn-based, while cream of wheat is wheat-based. Myself and siblings grew up starting the day invariably with fake coffee “kava” made of Melta and Chicory with some milk added to the cup. Buttered bread or “zemla” or “rohlik” were standard. On Sundays it was hot kakao and kolac( makovy, kakaovy, orechovy) ’cause Mother baked every Saturday. Krupicova kasa was an occasional supper fare when parents’ funds were low just before a payday. I liked it either with cinnamon or cocoa plus crystal sugar. I also dont remember having grits for a breakfast when I was a kid. We used to have for a dinner. Anyway, I am not so sure if grits from the south are exactly the same as we have. I mean I have never eaten american grits but I recall one scene from “My cousin Vinny” movie about grits. And the way how they explained the preparation of grits was kind of different and when I asked my american friend about it he told me it’s not “krupicova kasa” so I don’t know. Anyway, I have never eaten or bought american grits so I can not compare. But I loooove the Slovak ones. I remember eating grits and cocoa every morning when I was a small girl and lived in Slovakia. The recipe is easy and will bring some sunshine to the rainy days. We eat krupicova kase here (connecticut) but it’s called cream of wheat. When we eat grits (kind of rare anyway)it’s always salty and with lots of butter. Anyways, thanks for the idea, I know what I am making for dinner tonight. Oh, what a horribly angry avatar I got! Looks like I am all mad about the grits or something. Haha – sorry but that was really funny. Hmm, you can register on WordPress.com and upload a picture. It will then automagically appear here. We didn’t eat grits for breakfast, but after lunch or for dinner. I always made them with the milk(taste is definitely better,my mom made them always with milk and she was professional cook), plus, I add a little bit sugar inside. You can find grits at Russian store(Herndon), these are exactly the same as at home. I got them a while ago, they are very good. When I was in Germany, the American family over there would eat grits, but they would put cheese on the top. It was quite good, I liked it. velmi sa tesim, ze som objavila nieco take uzasne, ako tuto stranku. Pre mna je sice varenie konickom a viac-menej robim experimenty s jedlami inych kuchyn, ale krupicovu kasu robim pravidelne…..vsetci, dokonca aj tu v Colorade ju zboznuju:). Prajem krasny den a urcite buduci mesiac, ked budem na SK navstivim ocinou restauraciu…..a este pred tym sa pokusim urobit slivkove knedliky….haha, tie som naposledy robila doma…tu v USA nikdy. Dakujem pekne za comment! Ja som si prave znovu urobil kasu – tento krat na veceru. Je to super. Povedal som ocovi ze sa chystate. Dufam ze bude chutit. Bulgarians also eat this for breakfast (never seen it served for dinner), but we put only sugar and no cocoa or cinnamon. I have also seen Americans eating this for breakfast/brunch in my college in Connecticut. next time am baking i definitely take some pics and email it to you? Hm, krupicova kasa sa povie farina, nie grits. Bezne ju kupujem v obchode. why is everyone acting like grits is some ethnic food unfamiliar in the US? everyone in the US eats grits for breakfast. It is an iconic southern food. you dont need to go to a special store to buy it, it is in every supermarket in the US. you can probably even get it at 7-11. as to the difference between breakfast and dinner: for breakfast you eat grits and for dinner you eat polenta. although really it is the exact same thing with a different name. Alex, everyone’s confused here because we’re talking about completely different foods. Yes, grits is common in the south, and some folks like it for breakfast. But they don’t eat grits in Slovakia. What they do eat is cream of wheat. far cry from the grits, butter, and sugar we ate when I was a kid. but i’ll try it all the same. Krupica is ‘semolina’ here in the UK, you can buy it in any supermarket, usually (for some strange reason) in indian section. Can be coarse or fine – fine’s definitely better for ‘krupicova kasa’. And as for time when we eat it – my grandma used to make it for dinner when we were kids.. yummy !! Krupica was in my family for dinner. Most of the time with some sugar, cocoa and butter. For breakfst: “vianočka, bábovka, chlieb, rohlíky, žemle, etc. with some butter, jam, “salám”, honey, tomatoes, cheese etc. It’s interesting to see how different can breakfast be. Hi. My impression of this style of porridge is that it is almost exclusively given to children, I used to get it all the time as a young kid but I rarely saw or now see adults eating it. As for time of day, it was not considered to be exclusive to any, we ate it just as much for breakfast lunch or dinner. Essentially I think if my mother had nothing reaqdy for the kids this was always a back up, also because it is sweet and creamy it is generally popular with the kids. Krupicova kasa is made from semolina or wheatlets. Grits are corn based. You used wrong translation. My mother used to make krupisova kasa for me and my sister when I was child but not for breakfest. Only for supper. Mirka, you are right, Slovak krupicová kaša is semolina. However, the reason I prepared this dish with “grits” and why I also call it that is that grits is much more common in the United States. I don’t even know where to buy semolina – international food aisle perhaps? Well, I guess this depends on your grocery store. In addition, to me the word “grits” also has a visual meaning. 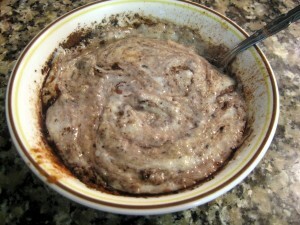 If somebody told me he or she was making “grits with cocoa”, I could pretty much picture what the dish will look like. Semolina porridge, on the other hand, not so much. But anyway, thanks for pointing this out! Alebo su to Krupicove Flameri? I don’t know. A mozno sa to ani nezapeka, len som si vzdy vsimla , ze to servirovali z velkych plechov. Dak ak vies ako na to, daj prosim ta vediet. Look for CREAM OF WHEAT. Krupicova kasa (cream of wheat, wheatlets) je vlastne hrubozrnna psenicna kasa. Grits, semolina, polenta, farine je hrubozrnna kukuricna kasa. Obidvoje dostat v kazdom obycajnom supermarkete v cerealnej aleji. Dokonca aj v Kanade. Cream of wheat is exactly what Krupicova kasa is. Great food!! I will try to make with grits. I learn always something new. All kasa is good. Enjoy! I am so happy Lubos started this website. Great food, great comments. Looking forward to new recipes. I first had this at the hotel in Detva when we were there for the festival one year; I swear they must have cooked the farina (cream of wheat, here) in cream, it was so rich! Now I make it for breakfast occasionally as a treat (I make it with milk, not water); I don’t use cinnamon, just cocoa powder (unsweetened) and powdered sugar sifted over the top, and enough butter to give my cholesterol level a spike. Yummmmm! I would like to use your image of grits (the 2nd one down from the top) in a book I am writing about Florida things. If I’m given permission, whom should I credit? Hi, My mother and grandmother always used Semolina flour. Never had grits and my family and I have lived in the US for 25 yrs. We had it for lunch or dinner and always when you were not feeling well. I would definitely recommend the Semolina. I don’t remember that I ever had it for breakfast as a child. Nowadays we make it from time to time for dinner. Did you know you can have it also cold as a dessert? Here in Switzerland it is known as “Griessköpfli”. I guess in english it’s semolina pudding. Anyway,it’s great both ways, warm and cold. My favourite breakfast dish as a kid was “chlieb vo vajci” or french toast how you call it. We also used to have it as a midmorning snack. When there was not much time to prepare the breakfast we had just a bread with lard topped with “vegeta”. Na Slovensku sa krupicová kaša varí z pšeničnej krupice hrubej alebo detskej, ktorá je jemnejšia. Ak by sa kaša varila z kukuričnej krupice, volala by sa kukuričná kaša.Slovo krupica znamená zrnitosť múky, cukru alebo aj drobné vyrážky na tvári detí. Na Slovensku máme 4 stupne zrnitosti múky. Každá sa hodí na iný druh jedla, múčne jedlá, cestoviny, pekárenské výrobky alebo zákusky. Naši predkovia varili hojne obilné kaše- ovsenú, pohánkovú a kaše zo strukovín- fazuľovú, hrachovú alebo šošovicovú. Jedli ich ráno, naobed i večer. Aj dnes nám tieto jedlá možu spestriť náš jedálniček. Semolina is coarsely ground grain, usually wheat, with particles mostly between 0.25 and 0.75 mm in diameter. The same milling grade is sometimes called farina, or grits if made from maize. It refers to two very different products: semolina for porridge is usually steel-cut soft common wheat whereas “durum semolina” used for pasta or gnocchi is coarsely ground from either durum wheat or other hard wheat, usually the latter because it costs less to grow. Inymi slovami, semolina je krupica mleta z tvrdozrnnej, alebo sklovitej, psenice (durum) a farina tiez krupica podobnej zrnitosti (hruba a hladka) ale mleta z mäkkej pšenice. Tato hladka farina je znama ako detska krupicka. hi misha, grits is old American thing (really popular in South US) It is made from corn and you can buy it anywhere in the US. May not be so popular or available in other countries, though it may be known under other name. Slovenska krupica je robena z wheat (psenice) ale grits z kukurice is pretty close. Use semolina in australia. you can buy it at woolies or coles. get the fine semolina though, not the course stuff. That sounds like such an awesome breakfast! 🙂 Yeah, it is a bit tough to sit down for hot cocoa and jam sandwich in this modern hurried life. But it’s such a great pleasure. Speaking of cereals, I now buy only whole grain. They are much cheaper (you can buy a box or a tub of oats, barley, or wheat) for under $2, and I would much rather add my own blackberries into them for the sweet flavor than rely on the sugar or corn juice put in them at the factory. I live in Virginia now, but grew up in Maryland and my parents were from the North; Pennsylvania. We grew up eating Farina(Semolina)/Cream of Wheat for breakfast, with sugar, butter and milk, and sometimes cinnamon for those who liked it. This is because my parents were from the North. In Southern Maryland, and Virginia and other souther states, grits (made from ground dried corn) is very common. Some eat them for breakfast with butter, sugar and milk, and some like them savory with butter or cheese for breakfast. For dinner, they are always savory; made with butter, cheese, garlic, or other seasonings. They are creamy, and are frequently topped with Shrimp or meats cooked in spicy seasonings. Most restaurants in the South offer grits on their menus) Polenta is an Italian use of corn grits, which is cooked the same, and eaten creamy or is allowed to cool and firm up and is then sliced and fried. ALL true Southerners eat (corn) grits. They are a staple in the South. Northerners usually are not familiar with corn grits. Corn grits can be found in most supermarkets, as someone already mentioned. Grits derived from the plentiful corn which grew in the South, and because corn/grits are cheap and readily available to everyone. I would think the same would be true for Farina(semolina) or Cream of Wheat which is more prevalent in the mid-west. The North accounts for very little crops in this country; the forte there is factories. I live in the UK and until earlier this evening ,I’ve never heard of grits (apart from what we have on the roads ,in icy conditions) Is it like porridge oats ? Can anyone enlighten me ? I always got gritz from America one of my friend usually bring for me, now I want start getting from South Africa as soon as possible. Oh my goodness, you people just made my day! This post brings me back to my childhood! My Slovak mother used to make this dish for me at least once a week for breakfast when I was a little girl. She used Cream of Wheat and we always put the butter, cinnamon and sugar on top and mixed it all in when it was ready to eat. I confess to adding extra sugar when she wasn’t looking. She never used cocoa, and that is an interesting variation that I am going to have to try. We ate it for dinner also. If you want to have it smooth, make sure that you will add it to cold milk, so you can mix it well not to have lumps. Some kinds prefers lumps, but I never did. Breakfast food were also lupacka a satocka and of course with hot kakao. My family hosted a foreign exchange student from Slovakia for the last school year. When she was to return home, I came back with her for a month. We ate this at least once a week for breakfast or dinner. I live in Georgia, and we have grits all the time. I was excited to find your website, so I could share many of the wonderful dishes I tried there with my family. Images are awesome, what is the license for them? Can I use them in my game, I want that hero could eat some nice porridge? Why would you stirr it you barbar! Gross. The cinnamon over powers the chocolate. Wow I’ve learned something new thanks to your post! =] I grew up in the U.S and have eaten grits my whole life! I ate them with sugar and butter mostly for breakfast. I still eat them now. Sometimes I put maple syrup in it and sometimes I put cheese in it. A few years ago I randomly decided to put chocolate in my grits, I had no idea other people did this. I just like to experiment with different flavor combinations lol. I loved it! I’m actually eating a bowl of grits with chocolate now as I type this! Also I love making a porridge with cornmeal cooked in milk. I love adding a variety of spices along with chocolate and nuts. I discovered the spices especially cinnamon helps enhance the chocolate flavor. will often come back someday. I want to encourage one to continue your great work, have a nice evening!